of guest workers from Jamaica. In a conversation with Barbara Ginley quite some time ago, when she was employed as the Director of the Maine Migrant Health Program, it was mentioned that issues facing seasonal guest workers are often somewhat different than those facing migrant farmers. Guest workers can not move from one farm to another. There are strict regulations concerning their employment. They can only work on certified farms. They must be provided with free transportation to and from their home country. Their housing has to be inspected each year. The mandatory wage in 2013 for seasonal workers is regulated by the Department of Labor. The Adverse Effect Wage Rate that was set in 2013 was $10.91 an hour. The majority of guest workers who are employed in the apple orchards come to Maine on H-2A visas. They are skilled workers who are often said to have the ability of outpicking novice workers in a rate of 5 to 1. Extremely knowledgeable of apples, they are aware of when certain varieties need to be picked and in the appropriate manner in which they need to be picked without damaging the delicate fruit or the branches of the trees. different than the casual apple picking that people tend to enjoy on a sunny autumn day. 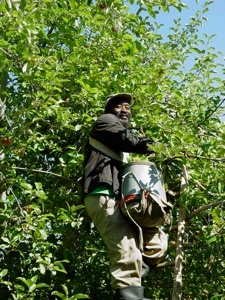 Commercial apple pickers are constantly carrying a canvas picking bucket up and down eighteen to twenty foot ladders. Some days the sun and humidity prove to be brutal. Other days could be extremely cool, windy, or damp. A bushel of apples can weigh in excess of forty pounds. A good picker can pick seventy-five to one-hundred bushels of apples a day. Can you imagine how so many trips balancing a heavy weight can wreak havoc on a person’s back and entire body? Obviously great coordination and athleticism are essential for this type of physical labor. 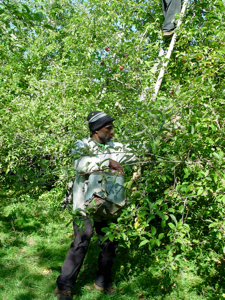 John Young from the New England Apple Council, a retired apple farmer who employed Jamaican workers for forty years on his farm, explained that the Jamaicans who apply to work in Maine are poor rural subsistence farmers. Many of them relish the opportunity to come to Maine to earn money that will enable their children to attend school. Public education is not an option in Jamaica. 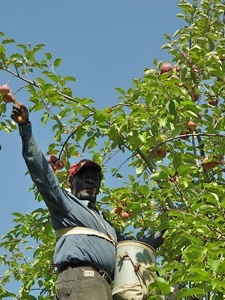 Kelly’s Orchard in Acton has welcomed Jamaican guest workers for many years. 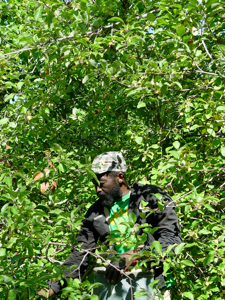 Art Kelly openly admits that if it weren’t for the Jamaican workers he would not be able to operate and maintain his orchard. He described them as exceptionally dedicated, friendly, and competent workers. 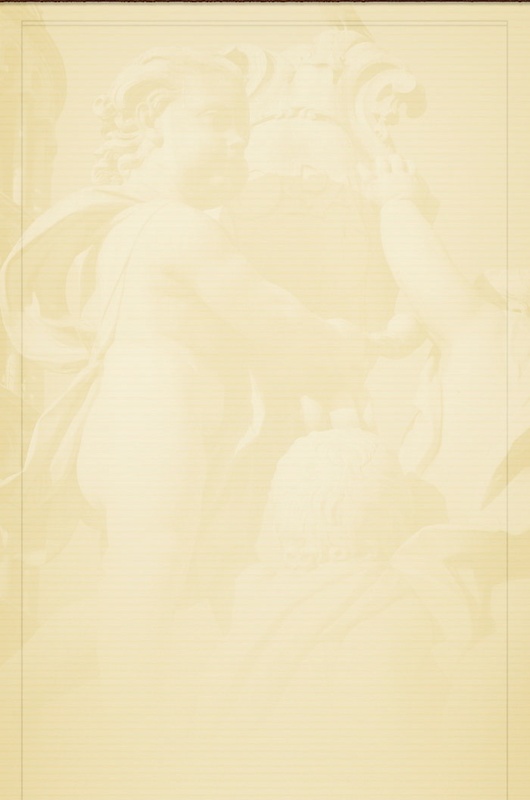 Art has developed good relationships with his workers. Many of them return year after year. 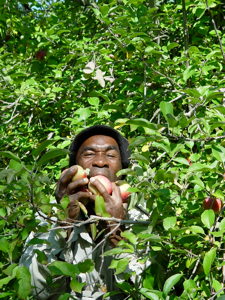 Irando has traveled from Jamaica to Acton to pick apples for over forty years. The men reside in a farmhouse at the orchard. 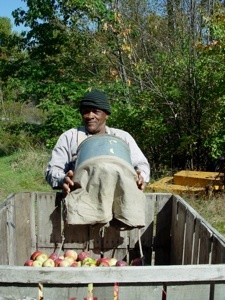 When Unique Maine Farms stopped by Kelly Orchards in the fall, meeting Irando, Derrick, and Leroy from Jamaica proved most enjoyable. Despite the arduous work with which they were involved, they managed to joke and enjoy friendly banter. They were more than willing to pose for photos and talk about their interest and appreciation in being able to return year after year. The process for arranging H-2A workers is quite complex and costly. Growers are required to place help-wanted ads in the media at specific times. Advertising is very expensive. The grower has to request domestic workers for orchard work at least sixty days prior to the picking season. If no U.S. citizens step forward then the grower must wait to see if their application for their H-2A workers has been approved and if the workers have cleared a security check. The New England Apple Council helps to process paperwork for the Jamaican apple workers. There are fees that must be paid to the New England Apple Council, Department of Labor, Department of Homeland Security, and for processing and transporting the workers. 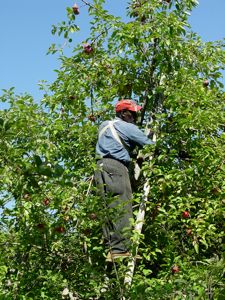 The apple orchard is required to provide federally-inspected free housing, partial reimbursement for travel expenses to and from the home country, and workers compensation benefits if the employee is injured on the job. there have been pickers coming from Mexico and Haiti. 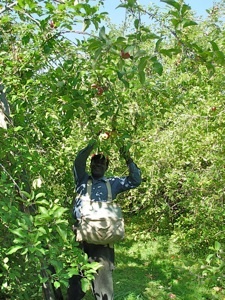 Pietree Orchard, an apple orchard profiled in the Unique Maine Farms’ project, used to employ the workers from Jamaica. Naomi King explained that her family greatly valued their work ethic and their amazing skills and production levels. The orchard took issue with the many restrictions that were set in place to employ the workers and the inability to reward the workers for their outstanding efforts because of federal legislation prohibiting this in the H-2A Visa program. Pietree decided to no longer support the guest worker program because of the many inequities that they felt were inherent in the program. Irando has returned to Kelly Orchards to pick apples each fall for over forty years. Teddy posing for a photo!